Your chance to save a life could happen today. Two families here in San Jose are looking for a match. The Asian American Donor Program will be at Roy’s Station Coffee Shop. 28-year old Nick Glasgow is in need of a bone marrow transplant. He is 3/4 Caucasian and 1/4 Japanese-American. Any person of Asian and Caucasian mix can be a potential donor. Across town a bone marrow donor registration drive will be held by the Lincoln Glen Little League for 6-year old Mateo Kohler. Mateo was adopted from Guatemala. Though finding a match might be difficult, it should be possible here in the Bay Area. I was recently pointed at a discussion thread on Yelp!, on the topic of the proposed Little Italy district somewhere near downtown San Jose. The post that caught my eye was near the top, where Anthony B. says “Gurus liquor store was the first grocery store in San Jose, Jeoy Francos PW, and it was Italian owned.” Earlier investigation had led to the information that the Guru’s Liquor building was built in 1934 by the same contractor who had earlier built my house, back in the 1910’s; so I wanted to find out if he had really also built San Jose’s first grocery store, and started the Joey Franco’s chain that’s still around today. Unfortunately, it turns out Anthony B.’s claim isn’t quite true, but there is an interesting story connecting the building and the Franco family. First, this wasn’t a Joey Franco’s PW Market. As the story is told on the PW Markets community page, Joey Franco started out in the grocery business working for his cousins, the brothers Henry and Joseph Franco, at their Franco Brothers Markets. 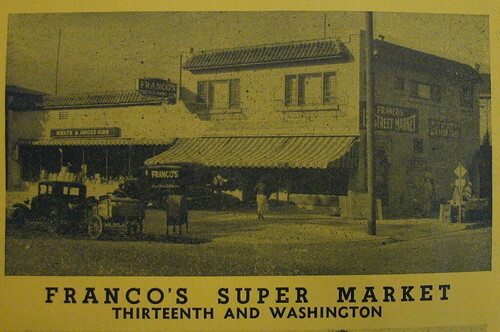 The 13th and Washington Street store was one of theirs, and it was known as Franco’s 13th Street Market. Second, this wasn’t the first grocery store in San Jose. It wasn’t even Franco Brothers’ first store. Visiting the California Room at the San Jose Public Library to review the old city directories, I found out that as early as 1925 they had a store on Santa Clara Street. It might have moved in the interim, but in 1932 they were located at 5th and Santa Clara, a site that is now, I guess, buried beneath City Hall. One of the key selling points was their own “$25,000 Ice Cream Factory”. 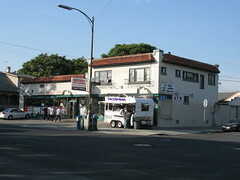 They built the 13th Street store in 1934, and by 1945 they had added a third store on The Alameda. They were still listed in the directory in 1950, but by 1960 Franco Brothers were out of business. So, what’s now Guru’s Market and Liquors wasn’t actually San Jose’s first grocery, and it wasn’t Joey Franco’s PW Market; but it was Italian-owned and in the Franco family. And that’s still a nice piece of San Jose history to keep in mind. Franco's Thirteenth Street Market, circa 1945. This Saturday May 30 is the 13th Annual Chocolate & Chalk Art Festival along North Shattuck Avenue. Amateur to professional artists young and not so young will be assigned areas of sidewalk to create their own chalk drawings for free; same-day registration at the event booths located along North Shattuck Avenue. Artist’s chalk is available for a fee. There will be a contest for the best drawing with a first prize of $250, judged after 4:00 pm. Now, on to the real reason we are here, chocolate! Select merchants (flying festival balloons) along North Shattuck Avenue, Vine Street, and Walnut Street will serve up classic chocolate treats like truffles (various types), dark chocolate sorbet, and ice cream to some very interesting items including chocolate chicken tikka kabob, Caribbean black bean chocolate soup, chocolate pizza w/ricotta, chocolate jalapeño gelato, and other joys. Check the chocolate to-go menu for items, locations, and times. Tickets are $10 for 10 tickets available at any of the registration sites; chocolate items are from 1 to 5 tickets each. Strolling around looking at the artwork, listening to music, and enjoying the day is free. Vendors with chocolate-related items and hand made arts & crafts fill the Farmer’s Market area along with entertainment at various locations throughout the day. This Business Directory Map has locations of area merchants, very handy. Take BART to the Downtown Berkeley BART Station and walk north six blocks. Posted in Art, East Bay, Eating Out, Events, Family, Fun, Weekend | Comments Off on Chocolate in Berkeley! SJ Rep called on the carpet! Our own San Jose Repertory Theatre is a really beautiful venue, even more so inside than out. They also generously support our community and youth, and are a huge contributor to the Cinequest Film Festival. San Jose would not be such a fun place to live without the Repertory Theatre. However, upon exiting the balcony from a recent show that I attended, I happened to look down at the steps and was shocked at the condition of the carpet. Threadbare, dull and worn, it really showed the effects of having thousands and thousands of feet walking through over the years. It was so disappointing to see how worn it was, and it really takes away from the great beauty of the rest of the building. So I was surprised and very happy to hear that the SJ Rep has received a Challenge Grant to remedy this exact problem! Emeritus Board member John Michael Sobrato has pledged to pay half the cost of new carpet if The Rep can bring in the other half with contributions. This is a very generous gift, and one I hope will not be missed. In even more wonderful news, The Rep has already raised one third of the matching funds. The other 2/3 must be raised by June 30, 2009, and despite their very generous regular donors, they need funds specific to this fundraising goal. Offers as generous as this don’t come around very often. It is my sincere hope that although we are all in some very tough times, the people of the South Bay can help pitch in to take advantage of this offer. If you could contribute just five dollars it would be so appreciated. If you could contribute $20 or $50 it would bring them even closer to their goal. They only have one month to collect donations in order to receive this Challenge Grant; I hope we can all pull together and help The Rep achieve this goal. Please contact Development Associate Janet Herrington to make a donation to this cause. She can be reached at 408-367-7264 or JanetH@sjrep.com. Posted in Buildings, Cinequest, Community, Donations, Downtown, Fundraiser, South Bay, Theater | Comments Off on SJ Rep called on the carpet! The neighborhood of Hanchett Park will host its first first Historic Homes Tour on Saturday. Hanchett Park was developed as a residence park in the early 20th century. Today, the area still has some of San Jose’s best preserved historic homes. When: Saturday, May 30. 10:00 AM to 4:00 PM. Where: Purchase same day tickets at 1265 Sierra Ave., San Jose. Addresses of Tour homes are provided on your ticket. Purchase advanced tickets at Silver Leaf Antiques (1343 The Alameda), Willow Glen Home and Garden (1123 Lincoln Avenue), or online. Price: $21 per person in advance. $25 on tour day. The Bay Area’s most celebrated TV chef, Martin Yan, will be appearing at San Jose’s Martin Luther King, Jr., Main Library this weekend. Chef Yan has hosted several TV programs, but is most well-known for “Yan Can Cook”, which first aired in 1978. Yan has also written numerous cookbooks. Yan lives in the Bay Area, and owns the “Yan Can” restaurants in Santa Clara’s River Mark shopping center and Pleasant Hill. At the library, Chef Yan will present a cooking demonstration and sign copies of his latest book, Martin Yan’s China, which will also be available for sale. If you’ve seen Yan’s television programs, you know that he is a terrifically entertaining presenter, and will give not only recipes for authentic Chinese food, but also explain the history and cultural signficance of the dishes he cooks. When: Saturday, May 30, 2009. 2:00 PM. Where: Caret Plaza, Dr. Martin Luther King, Jr., Main Library, 150 E. San Fernando St., San Jose. The next Cinequest Happy Hour is this Friday, May 29, at The Loft Bar and Bistro from 4:30 to 7pm. Of course you’re welcome to stay later if you like! Remember that you don’t need a ticket or an invitation, the CQ Happy Hour is open to anyone who loves film or would like to hang out with people who love film. Just head over to 92 S. Second Street in San Jose and order up a $5 Happy Hour drink or Appetizer, or one of The Loft’s famous martinis – it will be hard to not meet a new Cinequest friend after that! Earlier this month, Cinequest asked us all to send in our suggestions for the 2010 Cinequest Maverick Spirit award. The deadline to send in your ideas (to Publicity@Cinequest.org) is early this Friday. Then during this CQ Happy Hour we will be asked to vote between the Top 10 names that were presented. It is sure to be another fun filled time with the Cinequest family. Give it a shot, come on down and say Hello! One of the best festivals in the Bay Area is the Maker Faire (World’s Largest DIY Festival) and it’s happening next weekend, May 30 and 31st. Now in it’s fourth year, Maker Faire has grown not only in size (it now spans the entire San Mateo County fairgrounds now) but also in popularity. The first two years it was rather easy to park at the main parking lot outside the East entrance to the fairgrounds. Last year traffic was backed up for MILES on the freeway just getting to the place. Not to mention, once you were there, you had to drive a bit farther to dedicated parking lots/garages elsewhere and ride an old school bus (free) to the fairgrounds. I think it’s awesome that this service is provided and goes to show just how wonderful this event truly is. If you’re a Maker Faire virgin, what should you expect? Team Maker Faire boils it down to the categories of: Arts & Crafts, Science & Engineering, Robotics & Rockets, Sustainability, Fun For Kids, and Music & Fire. There is something for everyone. Bring Mom and Dad, bring your college buddies, meet up with your coworkers, or just come by yourself. Regardless, everyone will have something up their alley to watch, listen, or participate in. Throughout the two days, special guests will be performing or speaking. One that will be no doubt popular – Adam Savage of Mythbusters will be speaking on Saturday (2pm, MAKE Main Stage 2) on “Colossal Failures”. In the Arts & Crafts world at Maker Faire, if you’re into that sort of thing, there will be plenty at hand. Bazaar Bizarre (a fave of mine) will have a selection of indie designer and crafters on hand selling their wares. Swap-O-Rama-Rama is returning so if you’re into sewing be sure to bring a bag of unwanted clothes and your creativity. Donate the clothes and pick out some new ones and create a new outfit on-site. I checked it out the first year and noticed there were several sewing machines, screen printing machines, and all sorts of other resources (including fellow crafters) there for all your hand-making needs. Sculptures, working-machines, fire-breathing iron contraptions — the festival showcases so many amazing creations. Weekend and Day-Pass tickets are available. Note that while discounted tickets are no longer available via the website, there are over 75 locations in the Bay Area that offer discounted tickets. Don’t hesitate to check them out! Anybody who’s ever been to the Portland temple of cult doughnuts known as Voodoo Doughnut will instantly recognize a twisted twin sister in Campbell’s Psycho Donuts. Ranging from donut fries with dipping sauces to light airy donuts rolled in Rice Krispies, crushed malt balls or Cocoa Puffs, More traditional Banana Creme Pie or even Key Lime Pie (my favorite) the donuts are weird and not surprisingly, good. They’re very good. Crraaaaazzy good. So besides simply being the best at what you do, how do you market doughnuts in a city saturated (pun) with doughnut shops? With a little help from your friends. And–actually even more useful–your enemies. This morning, Twitter was all abuzz about a protest. Apparently just about every weekend since they’ve opened Psycho donuts sees a troop of protesters with placards protesting against their name. (They go home around 10) It offends them and all people who are clearly… well, how shall I say it? Maybe I better not. Let’s just call them sensitive. And really good marketers for Psycho Donuts. Better yet, let’s roll the video. To the tune of “Crazy” by the fabulous Patsy Cline. Now WHAT would they have said to her? Keep on top of the madness (did I really say that?) by following Psycho Donut’s Twitter stream, or just drop on by. The staff, BTW are super friendly and full of fun, if somewhat stunned by all the attention.